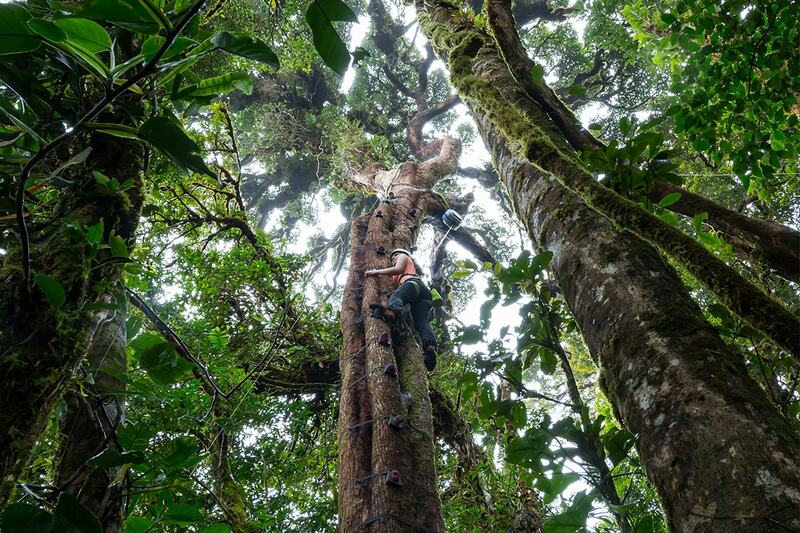 Arboreal Tree Climbing Park, is the first tree climbing park in Costa Rica. It represents not only a new adventure but a totally different way so you can enjoy nature and the cloud forest of Costa Rica. Explore nature while having fun and live a unique adventure. Arboreal is a Tree Climbing Park that seeks to provoke an experience at a deeper level by exploring the cloud forest from the bottom and the top of the trees, connecting our visitors with the natural environment. The tour consists of a climbing circuit of 4 trees that go from 10m (33ft) and up to 20m (60ft) high and with various levels of difficulty. The trees are equipped with handhold pieces designed for climbing but specifically adapted for trees. They are attached with straps to the trees, preventing any harm or damage to the tree, maintaining this way its full integrity. This system is also complemented with automatic belay systems, meaning, the adventurers will be attached to the unit, which is certified by the most important safety standards available, preventing belay systems operated by people, and so reducing the possibility of any error. You will climb any of our trees and once reached the top you will let go and the automatic belay system will descend you softly and safe to the ground.